The secret of sake's naturally mild and subtle taste lies in the unique way that its temperature is controlled, which draws out the power of the yeast. This sake brewery was built around 200 years ago and is still in use today. You can just feel the history. 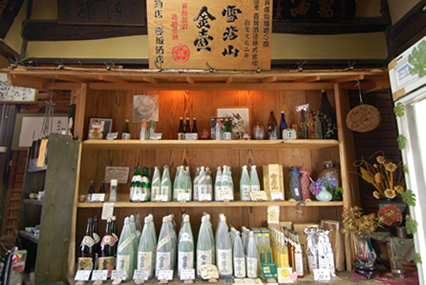 We began producing sake in Kanzaki Area about 400 years ago. It is recorded that we crossed over to our current Yumesaki River drainage system in the late Edo period, in 1805. Since then, we have dedicated ourselves to producing sake here. I am from the tenth generation of sake producers. In 2008, the brewery was designated one of Himeji city's Important Buildings of the Urban Landscape. We must look after this building in the same way that we make sake. I graduated from university 16 years ago and came back to my parents' house to begin my job as a chief brewer. If you compare sake brewing taught through university research to real sake brewing, the amount of preparation you have to do is completely different. At first I struggled because I just could not make the kind of sake I wanted. It took ten years before I finally managed to produce a mild taste that felt like Tsubosaka sake. People who like unfiltered, unprocessed sake love Tsubosaka Shuzo. We put time and effort into, "Fukuro Shibori," (extracting sake from bags). This gives the sake a nice and mellow taste. The mild taste of our sake reflects its gentle yet rich flavor and the way that we have carefully retained the flavor of the rice. Our sake is not sharp. It naturally has a mild taste with no stinging acidity. It feels hearty, as you would expect of a smooth, concentrated, and unfiltered beverage. 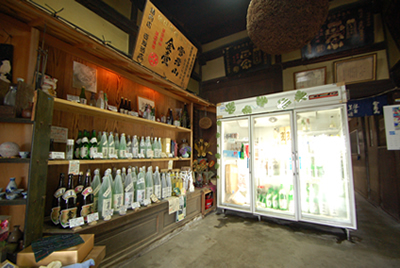 Most people who regularly buy Tsubosaka beverages are real sake lovers. Junmai Ginjo Seppiko San Unfiltered and Unprocessed Sake is arguably the face of our company. Customers look forward to the season when the new brew of it is released. It makes me so happy to see people who come all the way here to buy from us because they like the natural flavor of our unfiltered, unprocessed sake. I think that unfiltered, unprocessed sake goes well with meals like sashimi, in which you enjoy the ingredients themselves. Of course, you can also drink it while you eat. What is the secret of making sake? Polished brewer's rice being steamed. 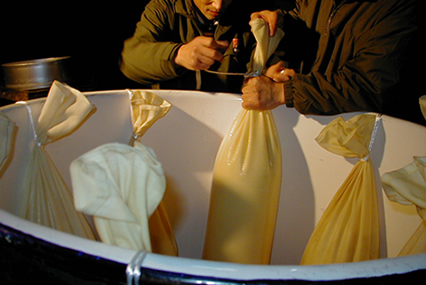 One characteristic of sake production at Tsubosaka is the way that we prepare the yeast for natural fermentation. We control the temperature in a special way. We make it so that there is a gap between the top and bottom temperatures. Creating a range of temperatures gives the yeast mash more energy. 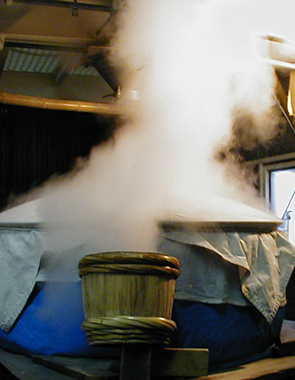 This temperature regulation process is the fundamental key to the sake's mild taste. The yeast is a living thing. We take care of the yeast so that it can do its job in a more comfortable environment. You might even think of us as yeast breeders. Our brewing techniques borrow from the power of nature, so there are subtle differences in the taste of our sake every year, due to climate and rice quality. This is another interesting thing about our products. While striving for natural tasting sake, we also actively seek out new ingredients. are popular with women arranged at the on-site sales location. It is a good place to enjoy the atmosphere of a brewery with a history. Junmai Ginjo Seppiko San Yume Nadeshiko is a sake made using flower yeast. When I first smelled natural yeast from the dianthus flower ("nadeshiko" in Japanese), I was charmed by its fragrance, which I had never experienced in any other sake. For a while, we were quite taken with flower yeasts. We experimented with wild yeasts made from things like climbing roses and rose periwinkles but we have continued to produce dianthus yeast, which is currently the most popular. After you smell the floral scent you will taste the round and distinct flavor. In 2008, we also developed a yuzu liqueur. Yuzu is an Asian citrus fruit. Women find it easy to drink. I would be happy if customers used this beverage as a starting point for getting into sake. 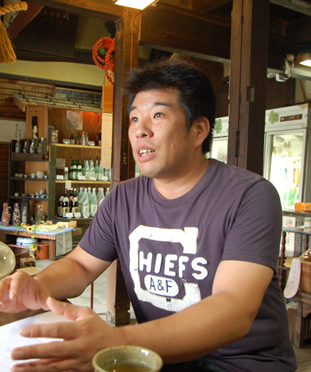 We are seen as the young leaders of the local sake brewing association. I was born in 1975, so I am part of Generation X. Many sons and daughters of brewery owners in the brewing association of Harima region are my peers. Like me, the majority of them studied fermentation science at Tokyo University of Agriculture. Members of the Harima Sake Brewers' Association get along so well and have such a good network that people from other regions are bewildered by us. It was a chief brewer from another brewery who helped me when I hit a wall after only just embarking on my brewing career. For chief brewers, technique is everything. Normally, it would be unthinkable for a brewer to advise someone from another brewery. But this brewer was kind enough to teach me a great deal. Harima brewers are broad minded and work productively and conscientiously together. This is because of Harima region's unique natural features and because people of my generation naturally get along so well. I happen to be the oldest member of that generation and I feel that I must be the standard bearer. Currently, I actively take part in events. I want to interact more with customers and publicize sake so that more people take an interest in it. I am enthusiastic about representing not just my own brewery but Harima sake in general for the whole the country.